Best Travel Guitars - Beam Me Up Scotty! Gives us our first look at what our future guitars will look like. You wanna peek? When one looks at the new designs and technology of guitars built today, you can’t help but wonder what they will become in say oh Star Date 4525 lol. Okay so I’ll do without the StarTrek quotes. 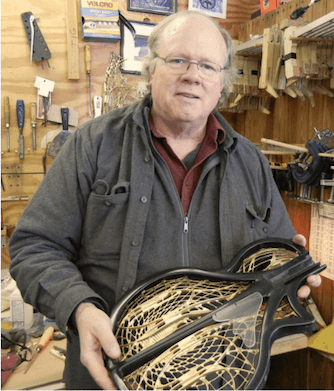 The Luthier of Ridgewing Guitars is Tim White, who 30 years ago had a dream to build a full size guitar that could be disassembled into smaller parts to make it more compact for travel. The first guitar that they experimented on was called the Black 12. This was 1981. In the early years the design was of a standard acoustic guitar, but made out of leather. The top was left off and a grill was made out of graphite fiber then attached to the leather body, enclosing a Mylar balloon that was inside the body. From this came a louder sounding guitar with a great tone. According to Tim White, in 1982 he said the second prototype called BIG UGLY didn’t sound very good as it had a few issues to over come and was regarded as a disaster. Another one of the issues was the body being made out of leather, also made it extremely heavy. One of the three positive features about this instrument though was, “it had a cool grill”. Not knowing where to go next with his design, the project was put on hold for a time. The Chrysalis Design started to take form over the following 15 years. This next guitar had to reproduce the sound that the earlier Black 12 did. It also had to be disassembled then reassembled with little to no effort at all. The next was what is called THE BOX that was in 1997. Yep this was a literal wooden box! with a neck on it. On the front was the grill material they were working with it to see what grill would sound good. And what material to make the grill from in order to deal with the string tension. Also the back of this box was open in order to test different types of inflatable devices to see which was better for acoustic performance. The data collected from this allowed them to continue the design of what was called the Chrysalis Guitar. At this point Tim White created a prototype that could literally be collapsed and put in a small case. In 1998 the grillwork was taking design. Based on the dragonfly wings, CAD design software was used to create this grill. I guess there really isn’t much that you can’t do with a computer and a program! Fast forward to 2000. Only a handful of the prototypes have been let out at this point. Only a few lucky people had the opportunity to have one of these guitars. 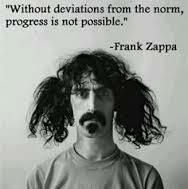 Musician Harvey Reid was one of those people. He points out that among the many attributes of his Chrysalis Guitars that after a decade they have not needed maintenance. Guitar collector Ed Roman had gotten a couple of these guitars. One of which I understand he would keep for his own personal collection. Ed Romans Guitars at the time listed the Chrysalis Guitar as “One of the Most Collectable Guitars Available”. Still considered today the biggest guitar collector around. Although I haven’t been there in a few years, I’v arranged for you a Guided Tour of Roma Guitars with a few close friends. Also The Museum of Fine Arts Boston added one of the Chrysalis Guitars to their collection, then they commissioned a composer to create a piece for the guitar then add the recording of the piece to it archives. 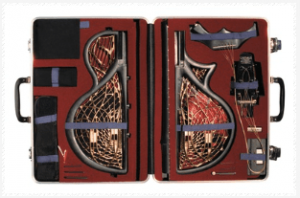 In 2000 the Chrysalis Guitar appeared on the front cover of Guitar Player Magazine. As It was getting great press and a lot of praise at this point. At this time production of the guitar was not practical, due to costs and construction of its components. So again it was shelved after its first 14 prototypes were completed. Then only those few people had the pleasure of owning one of these guitars. Fast forward to 2012 Mr White started his new company called Ridgewing shortly after meeting Arjun Mendhi. Research and development resumed shortly there after. 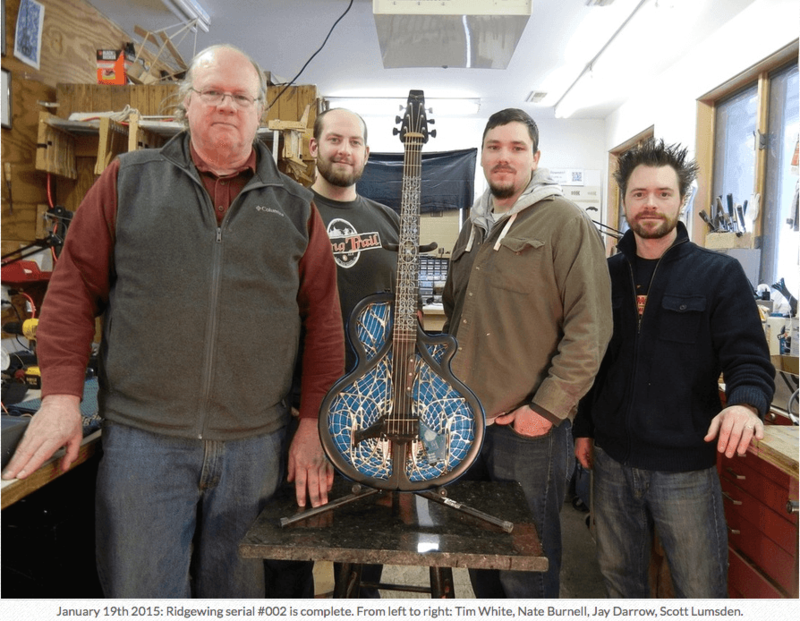 In 2014 Tim White put together a small team of designers and craftsmen in his shop in New Boston NH. In January 2015, three prototypes of the Chrysalis guitar have been completed. RidgeWing Guitars was also at the NAMM Show in California. Even before this launch they have on the table self-tuning headstocks, electronic chargeable bridge with a built-in pre-amp and ultra light necks. Offering guitarists unlatch personalization, acoustics and playing experience. This is truly an amazing story, theres so much more to it than what I’ve said. And you would do well to go read the entire thing here. And see for yourself what the future of the Best Travel Guitars is going to look like! And its for the professional player, as its a full performance guitar as well. Currently they are taking orders for the Chrysalis Guitars on a custom order basis. Visit RidgeWing.com for details. Well there you have it and it was a lot of fun putting this together for you. I do hope you have enjoyed this. 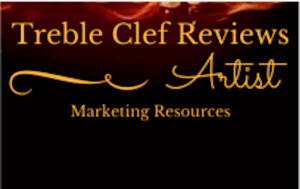 I look forward to your next visit to Treble Clef Reviews. Have to wish the team at Ridgewing success at their coming launch in Austin. Yep Raymond I’m with you. Its amazing that we have guitars today that tune themselves, now here is this new design thats way ahead of its time. You know I wouldn’t be surprised if soon they replace the steel guitar string for a laser string. Thanks for stopping by Richard, come back and see me. I have to admit. I never learned how to play a guitar, but have always loved the sound. Finding this and watching the video of the Chrysalis totally amazed me. I didn’t even know these existed. So cool. Looking forward to the future and stopping by to se move videos. It sounds like you have a little bit of a musician in you. I know that video was crazy. I remember the transformation of the rotor phone to the cell phone then to what we have today. I can’t believe that its possible to change an instrument thats looked the same for hundreds of years. But its happening, my how times are changing. Come back and see me till then! Wow that’s awesome. I’ve always wanted to be able to travel with a guitar without taking up so much space. I’ve had to just hope that there would be one when I was visiting someone. The one I have me is all broken and I’ve had to glue it back together. Strings are pretty bad, not ideal. This looks great, even the design and customizability of it I like. Maybe one day I can get one of these as well! Vince thats exactly my reaction to these guitars. They keep getting smaller and compact. I can’t imagine what they will look like in 50 years. These Luthiers did a real good job at its design. Although this is the model guitar they will debut with in a few days, they do have models that are more attainable for us more common players. Thanks for stopping by look to see you return. Very cool website. Awesome guitar and useful information. Hey Richard thanks, yea really nice guitar I’ve got more coming. See you the next time thru. Wow, Is all I can say, simply remarkable design in the guitar, I watched the video and I Absolutely love the sound, Reminds me of growing up listening to a guitar, whenever we all got together my family always came with their guitars to sing & play, good times, The Chrysalis guitars are definitely one of a kind. Great job, Love your website! Thank you Jennifer for stopping by. I know where your coming from as my family did the same thing. 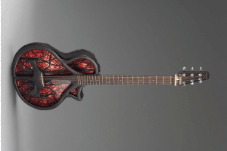 Your right that is one of a kind today, but it also gives us a glimpse at what kind of guitars are coming when these Luthiers combine high tech. to their craft. Glad you enjoyed see you the next time. Hello Dominic, I’m sure that there will be a few enthusiast that grab this new breed of guitar. But the best thing is, after the release then there will come the models that us common people can enjoy. Thanks for chiming in and I’ll see you upon your return.